MA8 and batch traceability marks, the mark of Max-Alloy® quality grade 8 (T) chain, the grade that should always be used for sling or lifting appliances. William Hackett have developed long term partnerships with both McKinnon Chain and Yoke industrial Corp to supply Grade 80 short link lifting chain and components that fully comply with both EN818 and EN1677. Both McKinnon Chain and Yoke Industrial Corp place great emphasis on their quality and traceability systems and have gained DGUV (Deutsche Gesetzliche Unfallversicherung, German Social Accident Insurance) Type Approval for their products, quality systems and manufacturing processes. DGUV is the umbrella association of the accident insurance institutions for the industrial and public sectors, one of the most recognized certificate associations in Europe. 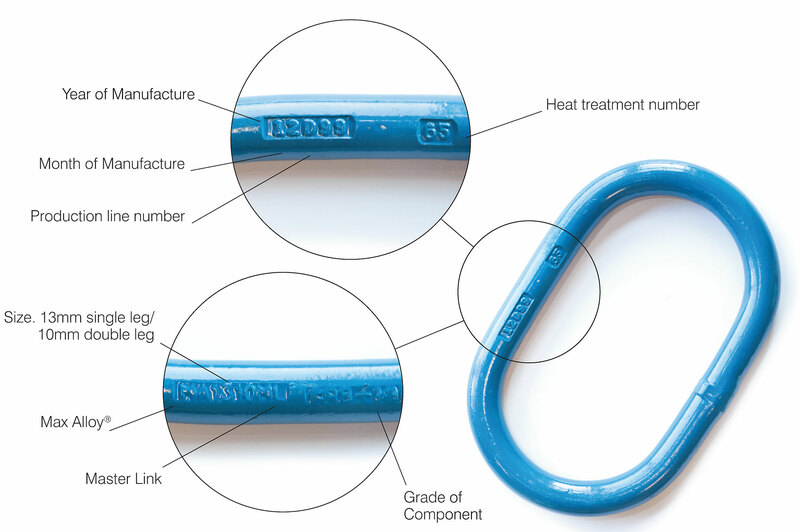 This allows both McKinnon Chain H46 and Yoke Industrial Corp H91 to H-stamp the Grade 8 chain and the Grade 8 components with their unique H number that indicates compliance and type approval to DGUV. DGUV test principles are in accordance with Directive 2006/42/EC. The test procedure also includes verification of the dimensions on individual samples, tensile tests, hardness test, bending test, test of heating resistance, test of the transverse stability, fatigue test, charpy V notch impact test and stress corrosion cracking. With this comprehensive testing procedure and certification of both Grade 8 chain and components, ensures Grade 8 lifting chain and components supplied by William Hackett contribute to a safest working environment.